Semtech Corporation (Nasdaq: SMTC), a leading supplier of high performance analog and mixed-signal semiconductors and advanced algorithms, announced two new additions to its EcoSpeed DC-DC converter platform. 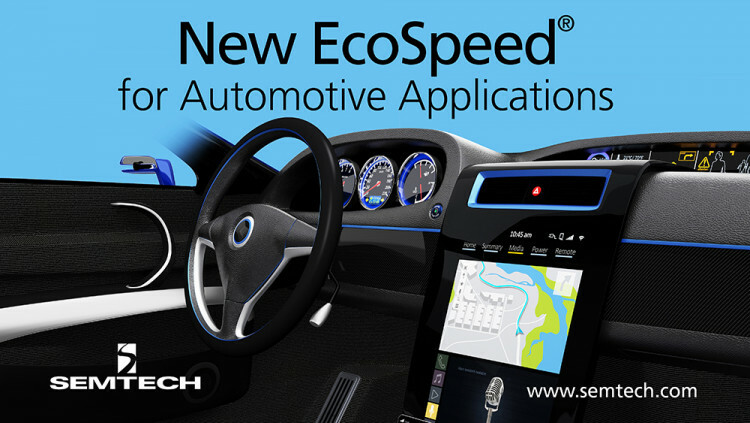 Semtech’s new Ecospeed devices are qualified for automotive DC power applications. The key capabilities of the new DC-DC converters include flexibility for a wide range of output voltages and optimized for high efficiency power conversion with low RDSON integrated synchronous switches. The EcoSpeed ICs operate at up to 90 percent high efficiency capability and a wide input voltage range of 4.5V to 40V. The DC-DC synchronous switching regulators are fully integrated power switches with internal compensation and full fault protection. The switching frequency of 2.2 MHz is compatible with automotive requirements enabling the use of smaller filter components resulting in reduced board space and reduced bill of materials (BOM) costs. The DC-DC converters (SKU: TS30041Q and TS30042Q) are available immediately in production quantities and are priced at $0.63 each in 1,000-piece lots. Semtech offers comprehensive design assistance, including field- and factory-based support. Datasheets, volume pricing, and delivery quotes, as well as evaluation kits and samples, are available at http://www.semtech.com/apps/form_request/. • Follow Semtech on Twitter, Facebook, LinkedIn and Google+. About EcoSpeed The EcoSpeed DC-DC converter platform incorporates Semtech’s progressive, patented adaptive on-time (AOT) control architecture to deliver ultra-fast transient response and very high efficiency across light to full power loads. This unique architecture offers the benefits of conventional converter topologies with optimal tradeoffs for superior performance in next-generation low-power, dynamic point-of-load (POL) applications. EcoSpeed DC-DC converters emphasize pseudo-fixed switching frequency, programmable switching frequency, power save, SmartDrive™ technology, and no external compensation components are required. Our converters help designers meet today’s insistent green power requirements. The EcoSpeed DC-DC converter platform incorporates Semtech’s progressive, patented adaptive on-time (AOT) control architecture to deliver ultra-fast transient response and very high efficiency across light to full power loads. This unique architecture offers the benefits of conventional converter topologies with optimal tradeoffs for superior performance in next-generation low-power, dynamic point-of-load (POL) applications. EcoSpeed DC-DC converters emphasize pseudo-fixed switching frequency, programmable switching frequency, power save, SmartDrive™ technology, and no external compensation components are required. Our converters help designers meet today’s insistent green power requirements. All statements contained herein that are not statements of historical fact, including statements that use the words “designed to,” or other similar words or expressions, that describe Semtech Corporation’s or its management’s future plans, objectives or goals are “forward-looking statements” and are made pursuant to the Safe-Harbor provisions of the Private Securities Litigation Reform Act of 1995, as amended. Such forward-looking statements involve known and unknown risks, uncertainties and other factors that could cause the actual results of Semtech Corporation to be materially different from the historical results and/or from any future results or outcomes expressed or implied by such forward-looking statements. Such factors are further addressed in Semtech Corporation’s annual and quarterly reports, and in other documents or reports, filed with the Securities and Exchange Commission (www.sec.gov) including, without limitation, information under the captions “Management’s Discussion and Analysis of Financial Condition and Results of Operations” and “Risk Factors.” Semtech Corporation assumes no obligation to update any forward-looking statements in order to reflect events or circumstances that may arise after the date of this release, except as required by law. Semtech and the Semtech logo are registered trademarks or service marks of Semtech Corporation or its affiliates.